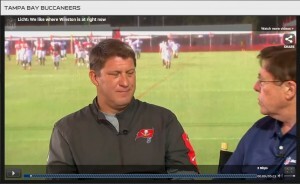 I read about the Buccaneers a lot. But I have been noticing that a lot of writers are pigeon holing the Bucs in ways that are easily disputed with a look at the actual game tape. Last year, the offensive line was porous. Actually, many called them a turnstile. This year, the offensive line was able to keep Jameis Winston off the ground a lot better than last year’s line would have. The two rookies on this line are actually the strong part of this line. Veteran Guard Logan Mankins has actually been the weak link in a few of the games, with his false starts and getting beat for a sack in a couple games. In this article about what’s at stake in week 5, the author makes a point to call the offensive line porous. Obviously they are not looking at the tape. In another article praising the Buccaneers for being tied for second place for fewest passing yards allowed, the author does not look at the fact that the great pass defense numbers could easily be explained by a bad run defense and the fact that the Buccaneers are usually behind early in the game and teams start running the ball more to use up time on the clock. Only the game against the Saints did the Bucs show up good against the run and the pass when they were able to sack Drew Brees a few times. This is part of the reason that I do not like to write about other teams, it is way too easy to fall victim to the misconceptions that some from not seeing the actual games of teams that you may be writing about. This comes after a season where the Buccaneers put Josh McCown in harm’s way week after week behind a “rebuilt” offensive line that couldn’t stop anyone from reaching the pocket. The 2014 season meant that the Buccaneers could select Jameis Winston #1 overall to be their franchise quarterback. Of course, with an offensive Offensive Line, the Bucs were afraid to put their #1 pick behind them without some massive changes. With the 2 second round rookies showing significant improvement in the first 5 days of camp, the prospects of Winston’s survival through week 3 of the regular season is looking up. Licht is feeling better about the improvement of the line after seeing the rookies learning the offense and adapting to the speed of the NFL (and the Buccaneers defensive line).